Jonathan James "Jon" Scheyer (Hebrew: ג'ון שייר‎‎; born August 24, 1987) is an American-Israeli former basketball player, currently an assistant coach of the Duke Blue Devils men's basketball team. Scheyer led his high school team to an Illinois state basketball championship as a high school All-American, and was one of the starters on the 2009–10 Duke Blue Devils that won the 2010 NCAA Basketball Championship, as a college All-American. He was a prolific high school scorer, and later an Atlantic Coast Conference (ACC) leader in numerous statistical categories, ranging from free throw percentage and three point shots/game to assists/turnover ratio. In high school, he once scored 21 points in a game's final 75 seconds of play in an attempt to spark a comeback. The 4th-leading scorer in Illinois high school history, he led his team to a state championship in 2005, and was named Illinois Mr. Basketball in 2006. Also in 2006, Scheyer was voted as one of the 100 Legends of the IHSA Boys Basketball Tournament, a group of former players and coaches in honor of the 100 anniversary of the IHSA boys basketball tournament. He chose to attend Duke for college, for whom he moved from shooting guard to point guard towards the end of the 2008–09 season, and was the Most Valuable Player (MVP) of the 2009 ACC Men's Basketball Tournament. In his senior year in 2009–10 as Duke's captain, he led the team to ACC regular season and Tournament championships, and to the NCAA National Championship. He led the championship team in points per game, assists, free throw percentage, and steals per game. Scheyer was a 2010 consensus All-American (Second Team), a unanimous 2009–10 All-ACC First Team selection, and was named to the 2010 ACC All-Tournament First Team. He played the most consecutive games in Duke history (144), shot the third-highest free throw percentage (.861), shot the third-most free throws (608), shot the fourth-most 3-pointers (297), and is ranked ninth in scoring (2,077 points). He holds the ACC single-season record for minutes (1,470; in 2009–10) and the Duke freshman free throw record (115), shares the Duke record for points off the bench in a game (27), and had the third-longest streak of consecutive free throws in Duke history (40). He was not drafted in the 2010 NBA Draft, but played for the 2010 Miami Heat Las Vegas summer league team; however, playing for the team in July he was poked in the eye by Golden State's Joe Ingles and suffered a serious, life-changing right eye injury in which his eye's optic nerve was injured, and he suffered a tear in its retina, which was re-attached surgically. He was a 2010 Los Angeles Clippers training camp invitee, but was waived in the team's reduction to its final roster. In 2011 he played shooting guard for the Rio Grande Valley Vipers of the NBA D-League. Scheyer was born in Northbrook, Illinois and is the youngest of three children of Laury (née Hitzel) and Jim Scheyer. He was raised in his father's Jewish religion, and was Bar Mitzvah. He began dribbling a basketball at age three and played in his first AAU national tournament six years later. As a youth, he played in a league called the Fellowship of Afro-American Men (FAAM), in Evanston, Illinois. He received a scholarship offer from Marquette University's Tom Crean as an 8th grader. Because Scheyer's talent was obvious by the time he was set to start high school, many people encouraged his parents to move so he could attend a high school with a powerhouse basketball program. The move was recommended so that he would have a greater chance of success. Scheyer shrugged off the suggestion, telling his parents: "We'll just do it here. We'll build the success at Glenbrook North." His father said: "I get chills thinking about it. That wasn't my vision. It wasn't Laury's. It wasn't his coaches'. That was Jon's vision, and it never occurred to him that anything else would happen." Scheyer attended Glenbrook North High School and led the Spartans to an Illinois High School Association Class AA state basketball championship as a junior, a 3rd-place finish in 2003 as a freshman, and an Elite Eight appearance in the state playoffs three out of four years from 2003–06. Scheyer was known as the "Jewish Jordan", and the Spartans' state championship team is the only high school state championship basketball squad in the nation known to have included an all-Jewish starting line-up. As a freshman, Scheyer led Glenbrook North in scoring and assists and was First Team All-State as a sophomore in 2004. Scheyer was the only non-senior among those First Team All-State selections and was the only underclassman on any of the first three All-State squads. As a junior, he averaged 26 points, 5 rebounds, and 5 assists. His coach David Weber said: "I call him a combination of Larry Bird and 'Pistol' Pete (Maravich). He's got the flair, the passing abilities. He's got good size. He's a rare player in this day and age." Scheyer rose to national fame in his senior year by scoring 21 points in 75 seconds of play during a one-man comeback effort in the last minute and a half of a high school game against Proviso West High School, in an effort to keep alive his team's 35-game winning streak. It has been called one of the best performances ever on a high school court. He averaged 32 points, 6 rebounds, 5 assists, and 3 steals for the Spartans as a senior. Scheyer's offensive game is amazing ... He hits jumpers from all manner of pogo-stick angles. He can hit runners while shooting back across his body. He can drive and finish in acrobatic ways. His offensive repertoire of ways to score is like a magician's bag of tricks. Offensively, he is a modern-day 'Pistol' Pete Maravich. "2006 Duke Basketball Commits". Scout.com. Scheyer's final four college choices were Arizona, Duke, Illinois, and Wisconsin. On the one hand, his connection with Illinois was strengthened by the fact that his high school coach was Illinois coach Bruce Weber's brother. In addition, when he had been in junior high school, he had really disliked Duke's team, because all his friends liked Duke and he wanted to be different. Militating in favor of Duke, however, was the fact that its assistant coach Chris Collins had also attended Glenbrook North. He also believed that playing for the Blue Devils provided him with the best chance of playing in the Final Four. He ultimately chose to attend Duke, where he majored in History. In the 2006–07 season he started all 33 Blue Devils games as a freshman, and scored a season-high 26 points in a loss to North Carolina on February 7, 2007. He led all freshmen in the ACC with an .846 free throw percentage, and was eighth in the ACC in minutes per game (33.7). He was an ACC All-Freshman Team selection, and was named "ACC Rookie of the Week" three times. He tied for second on the team with 39 steals, and averaged 12.2 points per game (third-best on the team). He also tied the Duke freshman record by making 115 free throws, and holds the third-longest streak for consecutive free throws made in Duke history at 40. Though not naturally a point guard, Scheyer spent some time playing the point due to lack of depth at that position. "It was a learning experience," Scheyer said. "It made me more confident bringing the ball up the court." Despite the fact that he was a starter as a freshman, Coach Mike Krzyzewski (Coach K) chose to start Gerald Henderson, Jr., in Scheyer's place for the majority of the season. Scheyer started only once during his sophomore year, but played in all 34 games. On December 20, 2007, he grabbed a career-high 12 rebounds against Pittsburgh. He scored 27 points at Miami on February 20, 2008, matching the most points by a player off the bench in Duke history. His free throw percentage (.889) was 2nd in the ACC for the season, 12th in the nation, and 5th-best in school history. He had a team-best 2.24:1 assist-to-turnover ratio, averaged the third-most minutes-per-game on the team (28.3), was fourth in scoring (11.7), and was widely hailed as one of the country's top sixth men. He averaged 3.9 rebounds, 2.4 assists, and 1.4 steals per game. Scheyer was named one of three captains for the Blue Devils for the 2008–09 season. He scored a then-career-high 30 points against Wake Forest on February 22, 2009. On February 19, Scheyer was moved from shooting guard, where he had played 91 games, to point guard; there he played well for the last 9 games of the season and into the post-season. As a point guard, he averaged 19.7 points and 2.5 assists per game, and committed 1 turnover a game. Florida State Seminoles men's basketball coach Leonard Hamilton said he thought Scheyer had a "calming" influence on the team's offense. Scheyer was 7th in the ACC in free throw percentage (.841) for the season, 8th in minutes per game (32.8), tied for 8th in steals per game (1.6) and three-point field goals made per game (2.1), and 18th in points per game (14.9). In the team's 36 games, Scheyer led the Blue Devils in minutes, free throws, free throw percentage, 3-point field goals, 3-point field goal percentage (.395), assists, and assists per game (2.8). He was named the MVP of the 2009 ACC Tournament after scoring 29 points in the championship game. Krzyzewski said after the season: "He's a great competitor. He handles the ball real well. He scores—he scored more when he was bringing the ball up than when he didn't bring the ball up. I think the more the ball is in Jon's hands, the better." Reflecting his off-the-court accomplishments, Scheyer was a 2009 ACC Academic Honor Roll selection. Scheyer had one of the best assist to turnover ratios in the NCAA. No player in the country has been as efficient with the ball as Scheyer has been ... [H]e consistently makes good passes and good decisions. Scheyer leads the nation with a 4.8-to-1 assist-to-turnover ratio, and when guarded by smaller point guards he will work off the ball, and take advantage of defenders not used to playing off the ball.... There are several other guards who are having great seasons ... but there aren't many who have had comparable seasons to date. Scheyer's like an old-time guard ... in that he does everything, in terms of handling the ball, shooting the ball, playing defense.... that's what makes him so tough, because he can do all those things and do them at a very high level for almost 40 minutes every game ... It's almost like having more than one player on the court. ESPN college basketball analyst Jay Williams said in March that Scheyer had been great and was deserving of being the NCAA Player of the Year or perhaps a co-Player of the Year with Greivis Vásquez. Commenting on his demeanor, Sports Illustrated sportswriter Stewart Mandel wrote: "Scheyer is one of the shyest Duke stars in recent memory. The next time he brags or trash-talks will be the first." There was a TV timeout with under four minutes in the second half. ...[W]e were tied, or down by one. There was 3:39 on the clock.... I came to the bench, and was kind of looking around. I thought: 'This is it. It is a three-minute game for our season, everything you've been working for your whole life.' I smiled, and went for it. That was the most surreal moment. That is a moment I'll never forget. With 2:37 remaining, he hit a 3-pointer to put Duke ahead 67–61. The Blue Devils won as he finished with 20 points, 5 rebounds, and 4 assists. In Duke's Final Four win over West Virginia, he led the team with 23 points while shooting 5 for 9 from 3-point range, with 6 assists, no turnovers, and 2 steals. Duke won the national championship with a 61–59 victory over Butler, as Scheyer scored 5 of the team's last 10 points. After Butler's Gordon Hayward missed a last-second shot, a media member said to Scheyer: "In the movies, that goes in." Scheyer laughed, and responded: "Good thing this wasn't the movies then." Scheyer had 15 points in the win, and led the team with 5 assists. He became the second player to win an Illinois high school state championship and an NCAA Division I championship, the other having been Quinn Buckner, who won state titles at Thornridge High School in 1971 and 1972, and then was a champion with Indiana in 1976. Scheyer played a prank after Duke's win. He tweeted his more than 6,700 Twitter followers: "Hollerrrrr at me!!! 847-970-....!". But instead of including his own cell number, it was the cell number of his former high school teammate Zach Kelly. Even Sports Illustrated was taken in by the ruse. After Kelly had received more than 2,000 text messages and several hundred calls, Scheyer tweeted his fans, begging them to stop texting and calling his friend. Sports Illustrated featured Scheyer on the cover of their April 12, 2010, issue. When the Duke team went to the White House in honor of their championship in late May, President Obama caught Scheyer off guard by calling him "my homeboy," when he introduced himself to Scheyer, and then saying it again ("my homeboy from the Chicago area") when he said he had been following Scheyer since his high school days in Chicago. Scheyer said: "that was probably the coolest moment of my life." Obama also noted that Scheyer, Kyle Singler, and Nolan Smith were the top-scoring trio in the NCAA for the year (at 52.4 points per game). Scheyer set the ACC all-time single-season record for minutes played in 2009–10 (with 1,470, passing Dennis Scott). Scheyer said: "I feel as though this is what I've prepared my whole life to do. There's never a time in a game when I feel I'm winded." In the 2009–10 season, he also led the ACC in assist/turnover ratio (3.0; 2nd-best in Duke history to Steve Wojciechowski in 1997), free throw percentage (.878; 7th-best in Duke history), and 3-point FGs made (2.8 per game). He also tied for 2nd in games with 20 or more points (17), and was 3rd in scoring (18.2 points per game), 4th in assists (4.9 per game) and 3-point FG percentage (.383), and 7th in steals (1.6 per game). For the season, he has also led the nation in assist/turnover ratio. He had 38 double-figure scoring games in the single season (tied for 3rd-most in Duke history with Elton Brand), 110 3-point field goals (the 6th-highest Duke season total; behind Trajan Langdon), 194 free throws (10th in Duke history, behind J. J. Redick), and was the 9th player in Duke history to score over 100 points for four seasons. Freshman guard Andre Dawkins said: "Jon’s the glue. He takes the big shots." In his career, he played in 144 consecutive games (most in team history, tied with Chris Duhon), played 4,759 minutes (3rd in both Duke and ACC history, behind Bobby Hurley), had an .861 free throw percentage (3rd in Duke history, and 6th in ACC history), sank 604 free throws (3rd in Duke history, behind Christian Laettner and Redick), 297 3-pointers (4th in school history, ahead of Bobby Hurley, and 10th in ACC history), played 144 games (tied for 4th on Duke's all-time list with Duhon), and had 114 double-figure scoring games (5th all-time at Duke, ahead of Mike Gminski and Grant Hill). In addition, he had 208 steals (8th in school history, behind Grant Hill), and had scored 2,077 points (9th on Duke’s all-time list, behind Jason Williams and Gene Banks). Asked to comment on his having passed the career 2,000-points mark, he said: "That's a pretty cool thing. I don't know all the names [of those] who have hit 2,000, but it's a great list to be part of. It's not better than a win tonight, and going to the Sweet 16, but it's still a great honor." He is the only player in Duke history to record at least 2,000 points, 500 rebounds, 400 assists, 250 3-pointers, and 200 steals in a career. Scheyer was a 2009–10 consensus All-American (Second Team), a Wooden and Lowe’s Senior First Team All-American, and was named to the 2009–10 All-America Second Teams of the AP, National Association of Basketball Coaches (NABC), Sporting News, and U.S. Basketball Writers Association (USBWA). In 2010 he was also a unanimous All-ACC First Team selection, an ACC All-Tournament First Team pick, and an NCAA South All-Regional and All-Final Four Team selection. In addition, he was named to the NABC and USBWA 2009–10 All-District teams, and the Jewish Sports Review Division 1 All-America team. He was also awarded the NABC Senior Achievement Award. He was second in voting for the ACC Player of the Year Award, to Maryland's Greivis Vasquez. In 2010, Scheyer was one of 6 finalists for the Bob Cousy Award (as top college point guard; awarded to Greivis Vasquez), and one of 10 finalists for the Lowe's Senior CLASS Award (as top NCAA Division I basketball senior; awarded to West Virginia's Da'Sean Butler). He was also one of 10 finalists for the John R. Wooden Award, one of 16 finalists for the 2010 Oscar Robertson Trophy, and one of 30 mid-season candidates for the 2010 Naismith Trophy, each a national player of the year award that in the end was awarded to Ohio State's Evan Turner. Doug Gottlieb of ESPN opined in early January 2010 that Scheyer "is probably not an NBA player, but his Jewish faith allows him to get an Israeli passport, and he would be a highly coveted player for a team like Maccabi Tel Aviv." David Thorpe, ESPN's resident expert on NBA rookies and noted trainer of NBA prospects, differed with Gottlieb. He noted most NBA teams would benefit by having Scheyer on their team as a sixth man. Chad Ford, ESPN's draft expert, rated Scheyer within the top-60 NBA prospects. Asked in March 2010 whether he feels he can make it in the NBA, Scheyer said he was confident he can. By early April, most NBA draft analysts thought he would be selected in the second round, but Larry Butler, his former AAU coach with the Illinois Warriors, thought he might go late in the first round. He's shown his toughness, his will to win. He brings all those little intangibles to the table that the elite players do. He's always making the right pass, always making the big shots, always making the big plays, always making his free throws.... The kid is a winner. He's always been a winner. Eamonn Brennan of ESPN announced the results of his College Basketball Production-Only Mock Draft in late May, meant to indicate how NBA teams would draft if they focused only at how college basketballs players played in college. He ranked Scheyer 6th, saying that as a college player, Scheyer was "ruthlessly effective". The Chicago Sun-Times opined that coaches Phil Jackson of the Los Angeles Lakers and Gregg Popovich of the San Antonio Spurs might value Scheyer's ability to move without the ball, pass, and spot up for jumpers. And one scout pointed to his poise, leadership, feel for the game, threat from the perimeter, smooth stroke, textbook form, and the vital role he played in the championship run, saying Scheyer can hold his own in the NBA and could be a solid backup point guard/no-stats-All-Star similar to Shane Battier. Scheyer signed with Mark Bartelstein of Priority Sports. Scheyer missed the NBA Draft Combine in late May and lost 10 pounds as he battled mononucleosis, which had him out for approximately three weeks and also forced him to miss his graduation. In June he participated in pre-draft workouts for ten teams, including the Chicago Bulls, Los Angeles Lakers, Milwaukee Bucks, New Jersey Nets, San Antonio Spurs, Utah Jazz, Portland Trail Blazers, Sacramento Kings, and Phoenix Suns. "I've spent more time at airports than with teams", said Scheyer, "but it's such a great opportunity." The Dallas Morning News reported in May 2010 that a NBA draft projection of NBADraft.net had the Dallas Mavericks selecting Scheyer with their first pick of the draft (the draft's 50th overall pick). Bleacher Report carried a mock draft article predicting him being drafted 51st by Oklahoma City, and Yahoo carried one predicting he would be drafted 53rd by the Atlanta Hawks. Draft Express compared 19 top shooting guards in the draft, on the basis of detailed points-per-possession statistics generated by Synergy Sports Technology. It found that Scheyer ranked as the most efficient overall scorer (at 1.054 PPP). His jump shooting ability when open gave him success in spot-up situations (1.16 PPP), but he also ranked well above average in isolation (.938 PPP; 3rd), and was the most effective pick and roll player on the list (1.16 PPP). but I'm not sure if that's even the best thing for [him] because when you're a second-round pick, you belong to a team.... I think it would be better to go to the team that really wants [him] because there will be teams that want [him. He's] going to be [a] good pro. He was not drafted, however, in the 2010 NBA Draft. Coach K elaborated on what he had said before the draft: "In the second round, it's better not to be drafted. As soon as the draft is over, if you are good enough, you will be invited by five or six teams, and you will have a chance to choose who you will play summer league ball with. I would be a little bit surprised if [Scheyer is] not on an NBA roster playing next season." Scheyer played on the Miami Heat's 19-man 2010 NBA Las Vegas Summer League team. He hit the game-winning shot in the team's first game. In the team's second game, however, in mid-July, he was poked in the eye by Golden State's Joe Ingles. He suffered a serious, life-changing right eye injury. He needed five stitches to close a cut to his right eyelid, his eye's optic nerve was injured, and he suffered a tear in its retina, which was re-attached surgically. Sidelined initially with an eye-patch and incapacitating headaches, he ultimately returned to the court wearing protective goggles to protect his eyes. Maccabi Tel Aviv coach David Blatt also approached Scheyer about playing in Europe. He just knows how to play, and that's a basketball skill. He's got such a nice feel for the game, and works so hard. There's not much maintenance with him. He doesn't make a lot of mistakes. This is a good chance to take a long look, and see what he can do here. It was just two months following his serious eye injury, however, and he was not 100%. On October 9, he was waived. After some additional time off to recover from his injury, on February 17, 2011, Scheyer signed a contract with the Rio Grande Valley Vipers, the Houston Rockets D-League team, which had 16 games left in their season. He had turned down several offers from overseas, and offers from other D-League teams. Scheyer said his eye had healed from the traumatic injury that he suffered in the NBA Summer League. On March 14, he had a D-League career-high 21 points and 7 assists against Sioux Falls Skyforce, the next night he broke those personal records with 24 points and 8 assists, and four nights later he scored a new career-high 27 points which included five three-pointers. In 24 regular and post-season games, he averaged 13.1 points, 4.0 assists, and 4.0 rebounds as the team finished the season as runner-up in the championship. Coach K said: "He got back on the horse. He did very well.... I'd like to see him go play internationally and be a key guy." In June 2011, Scheyer signed a two-year contract worth a reported $450,000 with Euroleague contender Maccabi Tel Aviv, the European league's 2011 runner-up and five-time champion. Maccabi Tel Aviv was 26–1 in 2010–11, and included NBA guard Jordan Farmar and former American college players Richard Hendrix (Alabama), Shawn James (Duquesne), and David Blu (University of Southern California). He began playing for Maccabi Tel Aviv when its season started on October 1, 2011. The team is limited to no more than four players who are non-Israeli, but because Scheyer has a Jewish father he had the ability to obtain Israeli citizenship relatively quickly, and did so in September 2011. As an Israeli citizen, Scheyer does not count towards that limit. "I am really excited to take the next step in my basketball career and go play for Maccabi Tel Aviv," said Scheyer. "I am looking forward to the opportunity to play for a team with such great tradition." Scheyer agreed to play with the Philadelphia 76ers in the 2012 Orlando Summer League. Scheyer played in five games in the summer league, averaging 5.8 points and 1.4 assists per game. After playing this league, he signed for Gran Canaria 2014 to play in the Spanish league. On April 29, 2013, Duke Men's Basketball Head Coach Mike Krzyzewski announced that he had named Scheyer to his staff as a special assistant after the resignation of assistant coach Chris Collins. With the departure of Steve Wojciechowski from the Blue Devil staff, Scheyer was promoted to a full assistant coach on April 18, 2014. Scheyer was a 2006 Inductee into the National Jewish Sports Hall of Fame. Jonah Keri wrote for ESPN in 2007: "Scheyer, is an honest-to-goodness M.O.T. If he continues to develop his Redick Lite repertoire, he could eventually become one of the all-time great Jewish basketball stars, right there with Dolph Schayes". 1 2 3 Bannon, Terry (December 16, 2007). "He's caught off guard; Scheyer adjusting to new role as sub for No. 6 Blue Devils". Chicago Tribune. Retrieved March 15, 2010. ↑ "Duke Blue Devils Basketball Statistical Database". GoDuke.com. Retrieved April 4, 2010. 1 2 "Sherron Collins Named Wooden Award All-American". Wibw.com. April 1, 2010. Retrieved April 2, 2010. 1 2 Corcoran, Tully (April 3, 2010). "KU's Collins an All-American". The Topeka Capital-Journal. Retrieved April 23, 2010. 1 2 3 "Scheyer, Singler & Smith Earn All-ACC Honors". GoDuke.com. March 8, 2010. Retrieved March 9, 2010. 1 2 3 4 "Accolades Pour in for Scheyer, Singler and Smith". GoDuke.com. March 16, 2010. Retrieved March 16, 2010. 1 2 Ryan, Shannon (June 24, 2010). "Evan Turner: As expected, Ohio State-St. Joseph product goes second in NBA draft". Chicago Tribune. Retrieved June 25, 2010. ↑ Dell, John (March 6, 2010). "Fortunate: Scheyer's parents get to go to games". Winston-Salem Journal. Retrieved March 6, 2010. ↑ Potash, Mark (December 27, 2004). "Grand fan motivates Scheyer". Chicago Sun-Times. ↑ McCurdy, John (January 6, 2010). "Q & A with Duke's Jon Scheyer". The Atlanta Jewish Times. Retrieved April 7, 2010. 1 2 Jonah Keri (February 12, 2007). "Ready for the madness". ESPN. Retrieved June 28, 2011. ↑ Sakamoto, Bob (January 2, 2004). "Soph's super, and he keeps getting better". Hartford Courant. Retrieved March 15, 2010. ↑ Winn, Luke (August 11, 2009). "Q&A with Jon Scheyer". Sports Illustrated. Retrieved April 3, 2010. 1 2 3 4 5 Jon Greenberg (February 11, 2011). "Jon Scheyer is patiently awaiting an opportunity to get back into pro basketball". ESPN. Retrieved March 24, 2011. 1 2 3 Sakamoto, Bob (March 24, 2006). "First Team – Gym rats raise game – Countless hours of extra practice pay off for Scheyer, Beverley". Chicago Tribune. Retrieved April 27, 2010. 1 2 Sakamoto, Bob (April 2, 2006). "Mr. Basketball of Illinois – Scheyer born to be the best – Tireless competitive spirit carried standout through 4 successful years at Glenbrook N.". Chicago Tribune. Retrieved April 27, 2010. 1 2 Evans, Thayer (March 30, 2010). "Jon Scheyer Is Quiet Leader for Duke". The New York Times. p. B13. Retrieved March 30, 2010. 1 2 3 King, Jason (April 2, 2010). "The fun has just begun for Duke's Scheyer". Rivals.com. Retrieved April 4, 2010. 1 2 3 4 Pollick, Josh (March 16, 2007). "Jon Scheyer stands out for Duke". The Jerusalem Post. Retrieved April 1, 2010. 1 2 3 4 5 6 7 8 9 10 11 12 13 14 15 16 "Jon Scheyer". GoDuke.com. September 28, 2006. Retrieved March 15, 2010. ↑ Mezydlo, Jeff (April 4, 2009). "2005 POY: Jon Scheyer". The News-Gazette. Champaign-Urbana, Illinois. Retrieved June 25, 2010. ↑ "Coach K's future player has incredible run; Scheyer scores 21 points in 75 seconds, but No. 1 Glenbrook North loses". MSNBC. January 17, 2006. Retrieved March 15, 2010. ↑ Wechsler, Bob (2008). Day by day in Jewish Sports History. KTAV Publishing House, Inc. p. 363. ISBN 978-0-88125-969-8. Retrieved January 25, 2010. ↑ Ryan, Shannon (March 17, 2010). "Chicago school of basketball well-represented in NCAA tournament". Chicago Tribune. Retrieved March 17, 2010. 1 2 3 King, Jason (April 6, 2010). "The fun has just begun for Duke's Scheyer - College Basketball - Rivals.com". Rivals.yahoo.com. Retrieved April 27, 2010. ↑ "Jon Scheyer". Highschoolelite.com. Retrieved March 15, 2010. 1 2 Powers, Scott (December 17, 2009). "Preps all-decade basketball team". ESPN. Retrieved January 25, 2010. 1 2 Patrick, Dan (March 23, 2010). "Scheyer admits he once hated Duke; talks about Purdue". Sports Illustrated. The Dan Patrick Show. Retrieved March 23, 2010. ↑ Powers, Scott (April 2, 2010). "Making memories – After three NCAA disappointments, Duke's Scheyer living his childhood dream". ESPN. Retrieved April 27, 2010. 1 2 3 4 Featherston, Al (March 12, 2010). "Scheyer Looking to Cement His Legacy". GoDuke.com. Retrieved March 13, 2010. 1 2 "Jon Scheyer". Sports Illustrated. Retrieved March 9, 2007. 1 2 3 4 2009–10 Men's Basketball Media Guide. 57. Atlantic Coast Conference. Retrieved March 31, 2010. ↑ "Duke Blue Devils Basketball Statistical Database – Jon Scheyer". GoDuke.com. Retrieved April 7, 2010. ↑ "Hurricanes earn breakthrough win over No. 5 Duke 96–95". USA Today. November 29, 2007. Retrieved March 15, 2010. ↑ "Duke Blue Devils Basketball Statistical Database – 2007–08". GoDuke.com. Retrieved March 15, 2010. ↑ Dinich, Heather (January 23, 2008). "Life off the bench is a pride-swallowing pill that is not for everyone". ESPN. Retrieved March 15, 2010. ↑ "Paulus, Henderson & Scheyer Named Captains For 2008–09 Season". GoDuke.com. Retrieved September 12, 2008. ↑ Miller, Ed (March 21, 2009). "Coach K pulls a surprise, and Duke goes on a roll". The Virginian-Pilot. Retrieved August 28, 2015. ↑ "Duke Blue Devils Basketball Statistical Database – 2008–09". GoDuke.com. Retrieved March 15, 2010. ↑ Strelow, Bret (March 16, 2009). "ACC Tournament Championship: Scheyer comes through with MVP effort". Salisbury Post. Salisbury, North Carolina. Retrieved April 27, 2010. ↑ "Jon Scheyer". Lowe's Senior CLASS Award. Retrieved March 15, 2010. ↑ "2007–2008 Duke Statistics" (PDF). GoDuke.com. Retrieved January 25, 2008. ↑ "Jon Scheyer". ESPN. Retrieved March 22, 2010. ↑ "Duke Blue Devils Basketball Statistical Database – 2009–2010". GoDuke.com. Retrieved March 18, 2010. ↑ Eichenberger, Bill (December 20, 2009). "Duke's Scheyer emerging as one of the nation's best players, regardless of position". Sporting News Today. Retrieved January 25, 2010. 1 2 Garcia, Marlen (January 8, 2010). "Scheyer quietly fits nicely into point guard role for No. 5 Duke". USA Today. Retrieved January 31, 2010. ↑ "Wisconsin ends Duke's perfect run in Big Ten/ACC Challenge". Associated Press. December 2, 2009. Retrieved January 25, 2010. ↑ McCreary, Joedy (December 15, 2009). "Scheyer on fire: Career-high 36 points leads No. 7 Duke past Gardner-Webb 113–68". Associated Press. Retrieved January 25, 2010. ↑ Bilas, Jay (January 12, 2010). "Scheyer, Wall lead All-America team". ESPN. Retrieved January 25, 2010. ↑ Gottlieb, Doug (January 7, 2010). "Breaking down the major conferences". ESPN. Retrieved January 31, 2010. ↑ "Scheyer Receives Third ACC Player of the Week Honor". GoDuke.com. February 15, 2010. Retrieved February 18, 2010. ↑ Fowler, Scott (February 11, 2010). "Scheyer is the difference". The News & Observer. Raleigh, North Carolina. Retrieved February 17, 2010. ↑ Yanda, Steve (March 3, 2010). "ACC POY race could be impacted by Wednesday's Maryland-Duke contest". The Washington Post. Retrieved March 3, 2010. ↑ Pinto, Michael (March 9, 2010). "March Madness 2010: An Interview With ESPN Analyst Jay Williams". Bleacher Report. Retrieved March 9, 2010. ↑ Mandel, Stewart (March 31, 2010). "Overachievers are worth rooting for". Sports Illustrated. Retrieved March 31, 2010. 1 2 3 4 5 "Post-Game Quotes – Georgia Tech Official Athletic Site". cstv.com. March 14, 2010. Retrieved April 27, 2010. 1 2 3 Powers, Scott (April 2, 2010). "Making memories – After three NCAA disappointments, Duke's Scheyer living his childhood dream". ESPN. Retrieved April 4, 2010. ↑ "Boxscore: Duke 78, West Virginia 57". GoDuke.com. April 3, 2010. Retrieved April 6, 2010. ↑ Haugh, David (April 6, 2010). "Best story lost, best team won in classic NCAA title game". Austin Post-Bulletin. Retrieved April 7, 2010. 1 2 Fleming, Jameson (April 6, 2010). "Gordon Hayward's Halfcourt Heave: Reaction to the Shot from Both Teams". Bleacher Report. Retrieved April 7, 2010. ↑ "Boxscore: Duke 61, Butler 59". GoDuke.com. Retrieved April 7, 2010. ↑ Gould, Herb (April 6, 2010). "Ex-Glenbrook N. star Scheyer goes out a winner". Chicago Sun-Times. Retrieved April 7, 2010. 1 2 Cahill, Dan (April 6, 2010). "Is this the end of the line for Jon Scheyer?". Chicago Sun-Times. Retrieved April 7, 2010. 1 2 Mitchell, Fred; Kaplan, David (April 7, 2010). "Jon Scheyer prank backfires on friend". Chicago Tribune. Retrieved April 8, 2010. ↑ Petchesky, Barry (April 8, 2010). "Jon Scheyer's Prank Was Pretty Darn Funny". Deadspin. Retrieved April 9, 2010. ↑ Chriqui, Emmanuelle (April 6, 2010). "Fans bash 'One Shining Moment'". Sports Illustrated. Retrieved April 8, 2010. ↑ "NCAA Champions – Back on Top". Sports Illustrated. 112 (16). April 12, 2010. Retrieved April 25, 2010. 1 2 3 4 "2010 NBA Draft Prospect Interview: Jon Scheyer". TheRookieWall.com. June 3, 2010. Retrieved June 11, 2010. ↑ Brian Strickland (May 2010). "For Duke Payback Is Sweet Obama Allows". The Herald Sun. Retrieved June 11, 2010. ↑ Kelli Anderson (November 22, 2010). "Three teams with national championship hopes". Sports Illustrated. Retrieved March 24, 2011. 1 2 3 "Notes: Duke 78, Baylor 71". GoDuke.com. March 28, 2010. Retrieved March 29, 2010. ↑ Tysiac, Ken (March 9, 2010). "Questions tire out Blue Devils". NewsObserver.com. Retrieved April 27, 2010. ↑ "Individual Basketball Statistics". Atlantic Coast Conference. Retrieved April 4, 2010. ↑ "Game Notes: vs. Butler, April 5, 9:21 PM, CBS". GoDuke.com. April 5, 2010. Retrieved April 6, 2010. 1 2 3 "2009–10 Duke Basketball Records" (PDF). GoDuke.com. Retrieved April 26, 2010. ↑ "Game Notes: vs. Arkansas-Pine Bluff, March 19, 7:25, CBS". GoDuke.com. March 19, 2010. Retrieved March 18, 2010. ↑ "Notes: Duke 73, Arkansas-Pine Bluff 44". GoDuke.com. March 19, 2010. Retrieved March 20, 2010. ↑ "Duke Blue Devils Basketball Statistical Database – Jon Scheyer". GoDuke.com. March 19, 2010. Retrieved March 29, 2010. 1 2 "Pre-draft workouts a success for the Jazz". byu.edu. Retrieved June 11, 2010. 1 2 "Scheyer and Singler Chosen to All-America Teams". GoDuke.com. March 9, 2010. Retrieved March 9, 2010. ↑ "Koch named Senior All-American". The Northern Iowan. April 6, 2010. Retrieved April 7, 2010. 1 2 "Notes: Duke 61, Butler 59". GoDuke.com. April 6, 2010. Retrieved April 6, 2010. ↑ Tysiac, Ken; Tudor, Caulton (March 29, 2010). "Thomas shines late for Duke". The News & Observer. Raleigh, North Carolina. Retrieved March 31, 2010. ↑ "Three Named to USBWA All-District Team". GoDuke.com. March 9, 2010. Retrieved March 9, 2010. ↑ "NABC Honors Collins With Senior Achievement Award". Wibw.com. April 4, 2010. Retrieved April 6, 2010. ↑ "Scheyer One of Six Finalists For Bob Cousy Award". GoDuke.com. March 5, 2010. Retrieved March 6, 2010. ↑ "Scheyer Named Finalist For Lowe's Senior CLASS Award". GoDuke.com. February 3, 2010. Retrieved February 8, 2010. ↑ "Duke's Jon Scheyer, West Virginia's Da'Sean Butler among Wooden Award finalists". Associated Press. April 1, 2010. Retrieved April 2, 2010. ↑ "Scheyer Named Midseason Candidate For Naismith Trophy". GoDuke.com. February 25, 2010. Retrieved March 2, 2010. ↑ "Scheyer One of 16 Finalists for Oscar Robertson Trophy". GoDuke.com. February 17, 2010. Retrieved February 18, 2010. ↑ Gottlieb, Doug (January 9, 2010). "Gottlieb on GT's upset of Duke". ESPN. Retrieved January 10, 2010. ↑ Mittleman, Jerry (December 24, 2006). "In an unpredictable tournament, Duke's Scheyer is one player to count on". Haaretz. Retrieved March 26, 2010. 1 2 Eamonn Brennan (May 27, 2010). "NBA mock draft based solely on college production". ESPN. Retrieved June 11, 2010. ↑ Jones, Mike (April 7, 2010). "Mike Jones: Who Will Wizards Take In Draft?". Comcast SportsNet Washington. Retrieved April 8, 2010. 1 2 "Former Blue Devils hoping to fulfill NBA dreams". The Herald Sun. Retrieved June 25, 2010. 1 2 3 Ryan, Shannon (June 23, 2010). "Scheyer looking to overcome odds again". Chicago Tribune. Retrieved June 25, 2010. 1 2 "Kings work out final prospects". Sacramento Press. Retrieved June 25, 2010. ↑ Enlund, Tom. "Bucks carefully look at a batch of unknowns". JS Online. Retrieved June 11, 2010. ↑ "Final workout group includes Duke star". KTAR.com. Retrieved June 25, 2010. ↑ "Mock draft: Mavericks to take former Duke star in next month's NBA draft". The Dallas Morning News. Retrieved May 18, 2010. ↑ Mike, By (June 17, 2010). "Mock draft: Take 6, Round 2 – NBA". Yahoo! Sports. Retrieved June 25, 2010. 1 2 "Situational Statistics: This Year's Shooting Guard Crop". Draft Express. Retrieved June 11, 2010. ↑ Stern, Rachel (June 29, 2010). "He's still coaching". NewsObserver.com. Retrieved July 6, 2010. ↑ "Jon Scheyer-#13-Guard-Heat". NBA.com. Retrieved July 24, 2010. ↑ Rick Behren (August 10, 2010). "News". Cslinsider.com. Retrieved October 2, 2010. ↑ Rick Behren (August 10, 2010). "Scheyer still healing from 'freak' eye injury". CSL Insider. Retrieved August 11, 2010. 1 2 3 4 "Clippers Notebook: Undrafted rookie Scheyer has taken his lumps". Pasadena Star-News. March 9, 2010. Retrieved October 2, 2010. 1 2 3 4 Steve Weisman (June 15, 2011). "Scheyer remains optimistic about future in NBA". The Herald-Sun. Retrieved June 28, 2011. 1 2 Dan Widerer (June 2, 2011). "Jon Scheyer is eager to crack the whip on his old man". fayobserver.com. Retrieved June 28, 2011. ↑ "Sports Shorts". Haaretz. Retrieved July 6, 2010. ↑ Scott Schroeder (September 22, 2010). "Jon Scheyer to Attend Training Camp With Clippers". NBA FanHouse. Retrieved October 2, 2010. ↑ Rob Mahoney (October 9, 2010). "Clippers cut Jake Voskuhl and Jon Scheyer". NBC. Retrieved March 24, 2011. ↑ "Clippers Waive Three". NBA.com. October 9, 2010. Retrieved October 23, 2010. 1 2 3 David Hinojosa (February 21, 2011). "Former Duke star Scheyer to make Vipers debut". The Monitor. Retrieved March 24, 2011. 1 2 Jon Greenberg (February 16, 2011). "Former Duke star Jon Scheyer signed an NBADL contract with Rio Grande". ESPN. Retrieved March 24, 2011. ↑ Payne, Terrence (March 9, 2011). "Now In The D-League, Jon Scheyer Is One Step Closer To The NBA". Dime Magazine. Retrieved March 24, 2011. ↑ From Vipers Reports (March 15, 2011). "Free throws doom Vipers". The Monitor. Retrieved March 24, 2011. ↑ Jonah Goldberg (March 15, 2011). "Skyforce Fall To Vipers By Nine". Keloland.com. Retrieved March 24, 2011. ↑ "Ole! Vipers Tame Austin Toros". KRGV. Retrieved March 24, 2011. ↑ "Maccabi Electra adds promising guard Scheyer". Euroleague.net. June 19, 2011. Retrieved June 28, 2011. ↑ "Maccabi Electra Tel Aviv BasketBall Club". 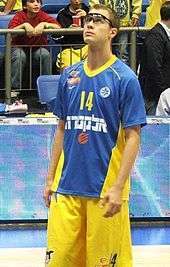 Maccabi.co.il. June 20, 2011. Retrieved June 28, 2011. 1 2 "Ex-Duke guard Jon Scheyer signs with Maccabi Tel Aviv". JTA. June 20, 2011. Archived from the original on June 23, 2011. Retrieved August 28, 2015. ↑ Gershman, Andrew (June 22, 2011). "Former Duke basketball star Jon Scheyer joins Maccabi Tel-Aviv". Jewish Journal. Retrieved June 28, 2011. ↑ Steve Wiseman (June 20, 2011). "Scheyer to play in Israel". The Herald-Sun. Retrieved June 28, 2011. ↑ Yarone Arbel (June 23, 2011). "Maccabi Electra reels in swingman Smith – 2011–12 Signings". Euroleague.net. Retrieved June 28, 2011. ↑ "Scheyer Signs Contract to Play With Maccabi Tel Aviv". GoDuke.com. January 1, 2010. Retrieved June 28, 2011. ↑ "Jon Scheyer To Play With 76ers In Summer". chicagohoops.com. ↑ "2012 Philadelphia 76ers summer league team". nba.com. Retrieved November 14, 2012. ↑ "Jon Scheyer completa el juego exterior del Gran Canaria 2014". ACB.com (in Spanish). ↑ Powers, Scott. "What others are saying about Ill. Hoops". IllHoops.com. Archived from the original on February 23, 2007. Retrieved May 16, 2007. ↑ "Blue (and White) Devil Jon Scheyer". Center for Sport and Jewish Life. Retrieved March 15, 2010. ↑ Roth, John; Hinshaw, Ned (2006). The Encyclopedia of Duke Basketball. Duke University Press. p. 207. ISBN 978-0-8223-3904-5. ↑ "Strawberry, Scheyer earn ACC weekly honors". Associated Press. February 26, 2007. Retrieved March 26, 2010. ↑ "McRoberts, Nelson and Scheyer Receive All-ACC Recognition". GoDuke.com. March 5, 2007. Retrieved March 7, 2007. ↑ "Blue Devils battle Bearcats in Greensboro". The Sports Network. March 19, 2010. Retrieved March 20, 2009. ↑ "Duke Wins NIT Season Tip-Off Tournament". Associated Press. November 27, 2009. Retrieved April 26, 2010. ↑ "Scheyer Selected as USBWA National Player of the Week". GoDuke.com. December 22, 2009. Retrieved April 26, 2010. ↑ "Duke hires former player Jon Scheyer as special assistant basketball coach". FoxNews.com. April 29, 2013. ↑ "Jeff Capel, Jon Scheyer receive coaching promotions". Duke Chronicle. April 18, 2014. ↑ "Jonathan Scheyer". The National Jewish Sports Hall of Fame and Museum. Archived from the original on February 10, 2007. Retrieved April 26, 2010.